In this tutorial, we will review the steps on how to configure the mail service of your Zen Cart website with SMTP. The Simple Mail Transfer Protocol will ensure that all system emails from your website are sent via a specific email account and are properly delivered to your customers. To create an email account on your hosting package, you need to log into your cPanel and navigate to the Email Accounts icon. 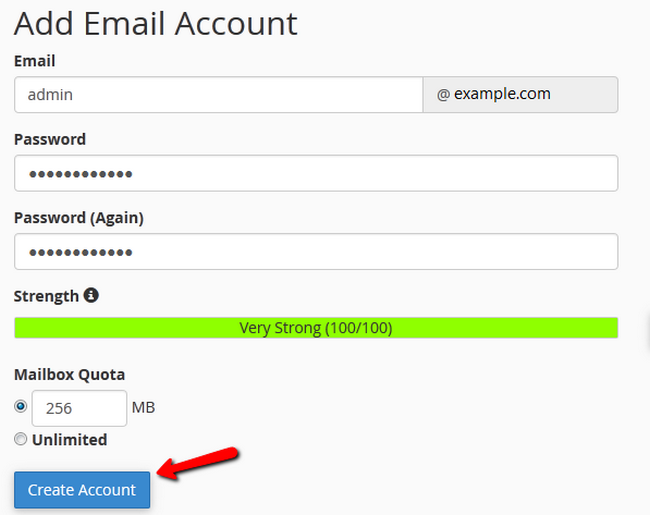 Fill in the information for the new email account and then click on the Create account button to keep the changes. Your new email account will be displayed just below the creation form. Next to your email address, click on the More button and then Access Webmail, from where you will be able to access that email account. To configure the mail service of your website with SMTP you will need to log into the administrative area of Zen Cart and go to the Configuration>E-mail Options section. Here you will see all of the email options for your website, the one you will need to change first is the E-mail Transport Method located at the very top of the list. Just click on the Info icon and then hit the edit button. Congratulations, you have enabled SMTP for the mail service of your Zen Cart Store.